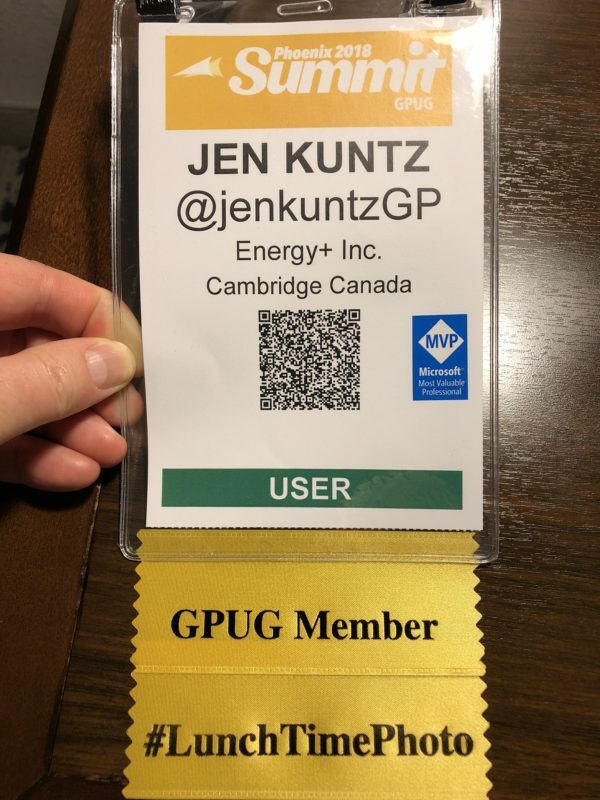 Today was a “long” day but a short day at GPUG Summit. This year’s conference is in Phoenix, Arizona. I originally wasn’t planning on attending, so my time here is short due to the length of my stay being primarily a factor of the cost of the flights I could find to get here! There is not much of interest on my flights today. The only funny item was the start of the day in Toronto. In my head, I was flying to Phoenix, which was via Calgary, but my destination was in the US. So, I walked all the way through the terminal to the US Gates where the TSA guy looked at me like I was an idiot when I showed him a boarding pass to Calgary. Doh! Otherwise the flights were fine. I’ve never flown “through” Canada when making a connection to the US so that was a little different. Clearing customs in Calgary was way less of a hassle than in Toronto, even though I have Nexus. The absence of lines just makes everything go faster. For the first time, I’m heading to a conference without my full laptop. I have no presentation responsibilities (where I would likely want to use it if I was doing demos), so I am travelling only with the Microsoft Surface Go I purchased last month. It was AWESOME. It’s so small that I’m travelling with a small messenger bag instead of a full backpack that I usually carry around. One thing I’ve been working on gradually is converting old notes from my paper notebook to OneNote. On the flight to Calgary (4 hours or so), I had room to spread out a bit and spent 3 of the 4 hours of the flight typing out notes and summarizing things into OneNote. I’m getting more and more used to the keyboard although I do make a few more typos due to the smaller size. I find myself fixing more things at least, but it’s enjoyable to type on. On the second flight to Phoenix, I was in a more cramped seat/aisle so I watched a Netflix movie I had downloaded. It was a dream… the small footprint allowed me to watch it propped up on the kickstand despite the slight recline of the person’s seat ahead of me and it was great! There was no choppiness at all in the video (granted it was downloaded, not streaming, so there wasn’t a reason for choppiness). I booked too late to get a decent hotel location so I’m staying near the airport at one of the hotels on the shuttle route. I have a humongous room! It’s too bad I won’t be doing much other than sleeping here to enjoy the separate living room area. Being in a shuttle hotel is a good thing though, no worries on having to get to the downtown area each day! David Gersten had a great “hack” for getting a Twitter handle on the badge, so I followed his lead to do it on mine when I checked in. My good friend Tim Wappat had mentioned there are so many people he only knows by handle that it would be helpful for him to see it on the badge! Great idea! The “first” for me at Summit was being a “User” instead of a “Partner”! I ran into a lot of people at the welcome reception who still hadn’t heard that I switched to the dark side (or it is the light side?! ), that I am no longer a consultant. I ran into so many friends and acquaintances from the Dynamics GP community in the reception, it was great. Honestly too many to list or I will for sure miss some names. I must have hugged or shaken hands with 50 people. That’s always my favourite part of the conferences, seeing the connections I’ve made over the years and catching up. One special person I met for the first time is Taylor Dorward, Shawn‘s son. I’ve written about “Pennies for Taylor” before, earlier this summer. Long story short if you haven’t heard about Taylor: he drowned on July 4th and was rescued by his friends, and has been recovering in hospitals ever since then. Just last week he was finally released and will be returning home for the next stage of his recovery. It will be the first time the family is back home in over 3 months. 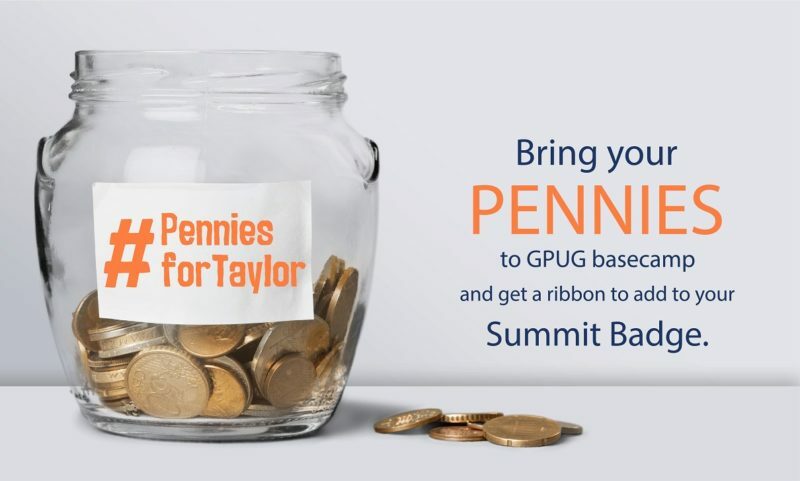 Kristen Hosman has organized a Pennies for Taylor jar and fundraising effort at GPUG Summit too. I’ve brought some bucks to contribute, as we don’t have pennies in Canada any longer! It was great to meet Taylor, having followed his recovery journey every day since July 4th. We had a great chat for the brief time I was with him, about possibly returning to college life in the spring (depending on how much his vision has improved by then), and getting to sleep in his own bed again at home. That was the end of my day. There was at least one sponsored party/event afterwards but I am somewhat of a slave to the shuttle schedule that I didn’t want to have to deal with a cab later in the evening. I returned to my hotel, watched a little TV and continued to work on my notebook conversion! Dynamics GP is on docs.microsoft.com! Download Uber or Lyft (I prefer Lyft) and go to those events! Wish I were there, have a great time.